Habit: Annual to shrub, matted or not. Stem: prostrate to erect, occasionally 0, glabrous or hairy, occasionally glandular. Leaf: basal, sheathing (on stem above basal, beneath other, +- non-sheathing cauline), or cauline, alternate, opposite, or whorled; blades linear to +- round, generally longer than wide, margins flat, wavy, or rolled under; ocreae 0. Inflorescence: variable, glabrous or hairy, occasionally glandular; peduncles 0 or erect to reflexed (pointed down); involucres 1 or in clusters, tubular, glabrous or hairy, teeth generally 4--10, awns 0. Flower: (2)6--100(200), with a stalk-like base ("flower stipe" or "stipe") or not; perianth generally white to red or yellow, glabrous or hairy, occasionally glandular, lobes 6, generally entire; stamens 9. Fruit: generally brown or black, generally obconic, glabrous or hairy; embryo curved or straight. Species In Genus: +- 250 species: temperate North America. Etymology: (Greek: woolly knees, for hairy nodes of 1st sp. named) Note: One of largest genera in California; stem in descriptions refers to the main stem(s), not branches of inflorescence. A perennial herb allied to Eriogonum austrinum (S. Stokes) Reveal and Eriogonum moranii Reveal of east-central Baja California, with spreading (rather than reflexed or erect) involucres on peduncles < 2 mm, occurring in DMtns (Bristol, Granite mountains), has been known for nearly 25 years yet remains undescribed. Eriogonum puberulum moved to Johanneshowellia. Habit: Annual 1--5(10) dm. Stem: 0.5--1 dm, generally tomentose. Leaf: basal and cauline; blades (0.5)1--4(4.5) cm, (0.2)0.5--1(1.3) cm wide, generally tomentose. Inflorescence: 5--80 cm, 10--60 cm wide; branches generally tomentose to +- glabrous; peduncles erect, 1--2 cm, straight, slender, tomentose or glabrous; involucres 1.5--2.5(3) mm, hairy. Flower: 1.5--1.8 mm, glandular-hairy; perianth white to rose, lobes generally elliptic to obovate, outer occasionally inflated basally. Fruit: 1--1.5 mm, glabrous. 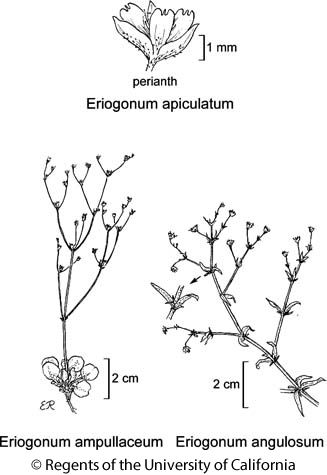 Citation for this treatment: James L. Reveal & Thomas J. Rosatti 2012, Eriogonum angulosum, in Jepson Flora Project (eds.) Jepson eFlora, http://ucjeps.berkeley.edu/eflora/eflora_display.php?tid=24690, accessed on April 22, 2019.
c&s SNF, Teh, SnJV, CW, TR, s PR, w DMoj. Markers link to CCH specimen records. Yellow markers indicate records that may provide evidence for eFlora range revision or may have georeferencing or identification issues. Purple markers indicate specimens collected from a garden, greenhouse, or other non-wild location.